John Wesley Givan,79, of Elizabethtown passed away Thursday, June 28, 2018, at Robley Rex Veterans Medical Center. He was a member of the Church of God of Prophecy of Elizabethtown, a veteran of the United States Air Force and an employee at Thomas’ Poultry. He was preceded in death by his parents, John Hiram and Lillie Aubrey Givan; one brother, Roy Givan and four sisters. 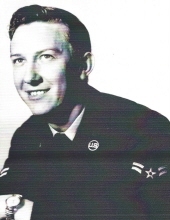 He is survived by two sons, Mark Givan (Janet) and Michael Givan; two daughters, Juliana “Julie” Smith and Cathy Odessa Rigdon (David); four grandchildren, Stephanie Jones, Candy Damron, Anthony Ross (Taylor) and Alexis Smith; and five great grandchildren, Angel Jones, Landon Rigdon, Christian Riveron, Mayson Damron and Cyrus Willon. Funeral services will be conducted at 11 a.m. on Monday, July 2, 2018 at Dixon-Atwood & Trowbridge Funeral Home with Brother Wayne Borders officiating. Burial will follow in Elizabethtown City Cemetery. Visitation will be from 1-8 p.m. Sunday and after 9 a.m. Monday at Dixon-Atwood & Trowbridge Funeral Home. To light a candle of remembrance or leave a condolence, please visit www.dixonatwood.com. Dixon-Atwood & Trowbridge Funeral Home have been entrusted with arrangements. To plant a tree in memory of John Wesley Givan, please visit our Tribute Store. "Email Address" would like to share the life celebration of John Wesley Givan. Click on the "link" to go to share a favorite memory or leave a condolence message for the family.